I don’t know about you, but when I am packing for a trip I always think way too much about what will happen if things go wrong. This is amplified when I go on professional trips, where looking like tired or sloppy would lower my confidence. This means I put a lot of thought into what makeup products I bring. Since there have been lots of beauty-centric conversations among archaeologists on social media lately, I thought I’d share! As a person with naturally bold but patchy eyebrows (thanks, Dad) I always focus attention on filling in my brows. I often stop with just eyebrow makeup to be honest. Lately I like Benefit Ka-Brow because I can build from light to very bold brows with one product, which is more control than I have with my Anastasia Brow Powder or MAC Eyebrow Pencil. I also love my brow highlighting pencil called High Brow (from Benefit) which makes them look cleaner and higher. For me, Bareminerals powder foundation is most foolproof foundation for evening out my complexion, even when I put on my makeup in ugly fluorescent lighting using the teensy mirror attached to my makeup bag (that seems to happen at every conference.) Sometimes I just want to feel like a human without red blotches and bags under my eyes. The beauty is I can use the small end of my double-ended brush to pack on extra powder to anywhere that needs concealing, and it requires no skills or sleep to do properly. Once I add foundation to my face I look “unnaturally pale” (according to my mom) so I add a teensy tiny bit of Warmth on the brush and put it on my cheeks, hairline, and under my jaw. If I am feeling extra fancy I will contour my face by pinching the Flawless Face brush into a line and carve out my cheeks so I look thinner. After that I dust on some Mineral Veil which makes my skin look smooth even when it is gasping for moisture. Sometimes a little shiny stuff or eyeliner can make a person feel like they’re ready to face some scary stuff on zero sleep, and that is why I pack several eye makeup products. 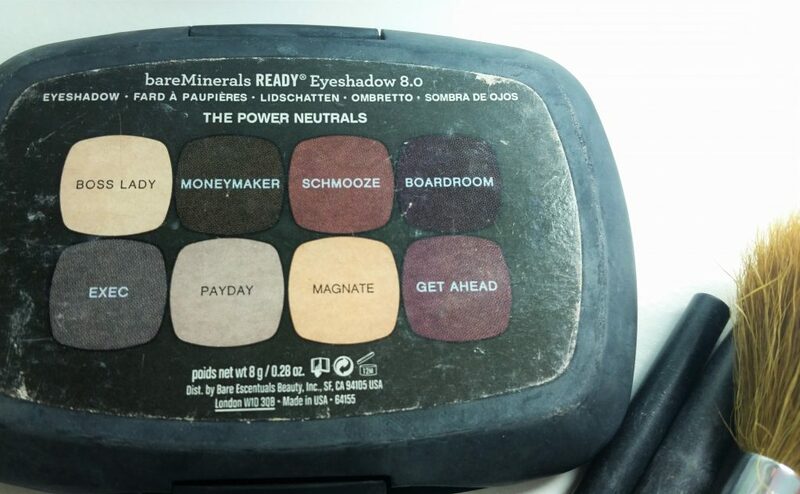 My absolute must-have is this eyeshadow palette from Bareminerals called The Power Neutrals. I use this set of colors for every type of look from neutral to dramatic so it is perfect for travel. I usually use an angled fluffy brush to apply one of the beige colors (matte “Magnate” or sparkly “Boss Lady”), use the same brush to put a little bit of gray (“Exec”) in my outer crease. If I am feeling like a sassy eyeliner, I draw it on with the MAC shader brush using dark brown shadow (“Boardroom”). On occasion I put on mascara, if it seems worth having itchy eyes all day. In case of a party, I always bring one sparkly or brightly colored thing to spice things up. This time, I am going with MAC Mineralize Duo eyeshadow compact which is ultra sparkly, in a light purple/bright bronze combination. I tested my sparkly makeups and this one falls off the least, and looks nice even when it does. Primer is your friend when it comes to traveling. A good primer will protect your skin as well as hold your makeup on your face until you intend to take it off. I happen to have a primer which also moisturizes my face and has antiseptic qualities (in case my face touches a dirty airplane seat, I guess.) 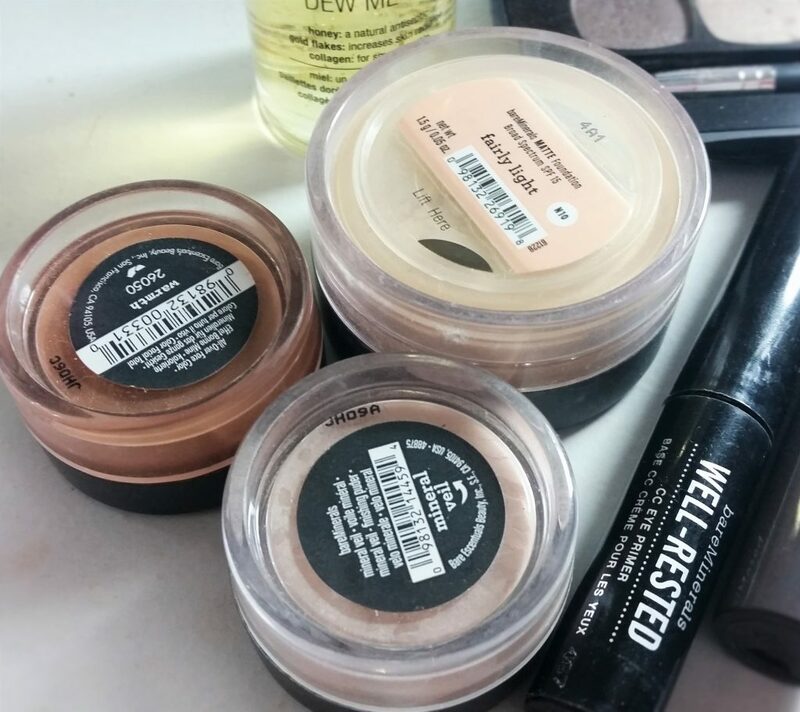 I like the NYX Honey Dew Me Up one because it is moisturizing but it does not leave any sticky residue, so it is perfect for powdery makeup like Bareminerals. In an ideal world I would be able to fit some sort of makeup setting spray in my carry on liquids but I don’t think that is going to happen. If I don’t forget, I also put on eye primer (a stick! no liquids to carry on!) so my eye makeup stays on my face for a long time. It is pearl color so sometimes I cheat and just use it as eyeshadow. Being tired makes the skin around my eyes purple. My whole face turns red from the environmental irritants associated with mass transit. Bareminerals honestly covers most of this stuff but a cystic acne breakout or rosacea requires the big guns – MAC Studio Fix – otherwise known as industrial strength, tattoo-covering concealer. I am currently testing out a lighter formula of concealer (NYX HD concealer) that can double as a highlighter, to bring lightness to my face in contrast to any contouring product I may use. I am inclined to just bring the stain because it is multi-purpose and I can build it to a bright color for the wedding I am attending after the conference. What do you all think? 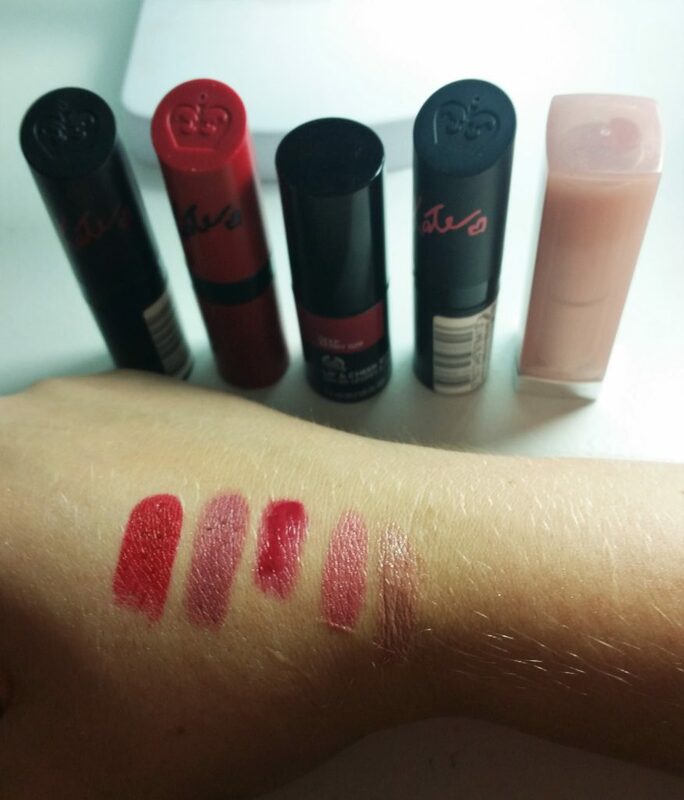 Will I stick out like a sore thumb if I wear my signature red or mauve (the left 2)? 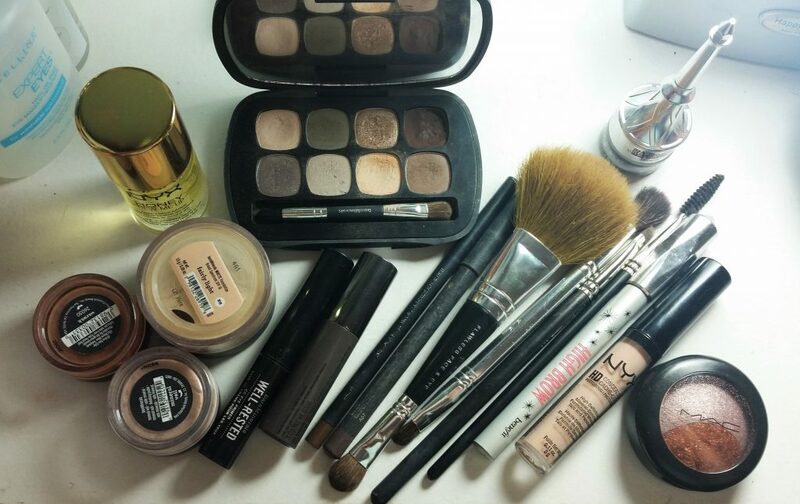 What is in your essential makeup kit?